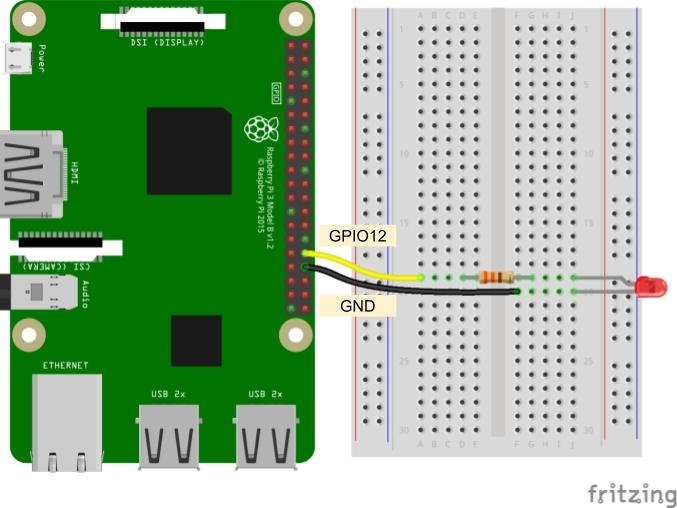 The Raspberry Pi is a great single board computer, but like most computers, its functions rely mostly on human input. That means whenever you start up (or boot) your computer, it waits for your input to run programs. That's great, but how do we get our programs to run automatically whenever the computer boots? Before adding your program to any startup script, it's extremely important that you test it first on its own! 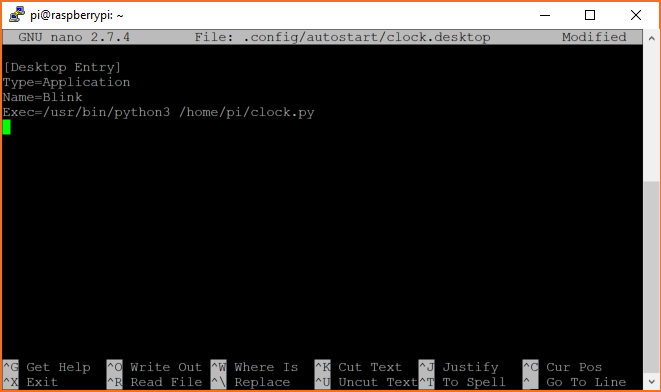 Run it with just the python command to make sure there are no problems with your program. It's much harder to track down bugs in your code when it runs as part of the boot process. autostart - Used to automatically run your programs once LXDE (graphical desktop environment used by Raspbian) starts. It's slightly more complicated than rc.local, but it lets you run programs that require graphical elements. Please note: If you have trouble seeing any of the images throughout this tutorial, feel free to click on it to get a better look! The next example that we'll use is slightly more complicated, as it relies on a GUI made with the Tkinter package. We'll use this program when we want to demonstrate how to start a program on boot that requires the X windows system (for example, you want to make a graphical dashboard that is displayed on boot). Running your program from rc.local is likely the easiest method, but because rc.local is executed before X starts, you will not have access to GUI elements. As a result, it's recommended that you only use rc.local for starting programs that do not have graphical elements. The rc.local script is executed after all of the normal system services have been started (including networking, if enabled) and just before the system switches to a multiuser runlevel (where you would traditionally get a login prompt). 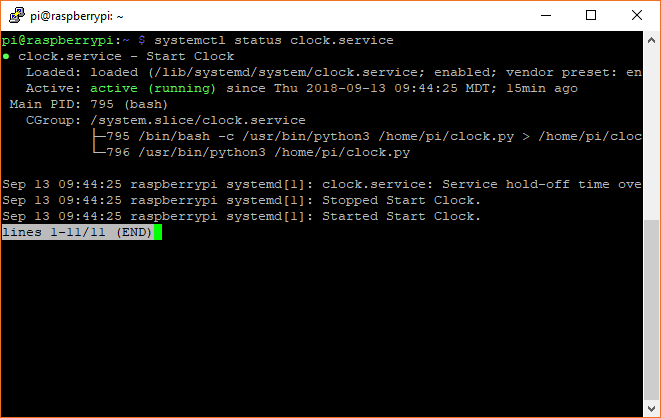 While most Linux distributions do not need an rc.local, it's usually the easiest way to get a program to run on boot with Raspbian. Note: the ampersand (&) at the end of the line is needed so that your Python script runs in a different process and does not block execution of the boot process. 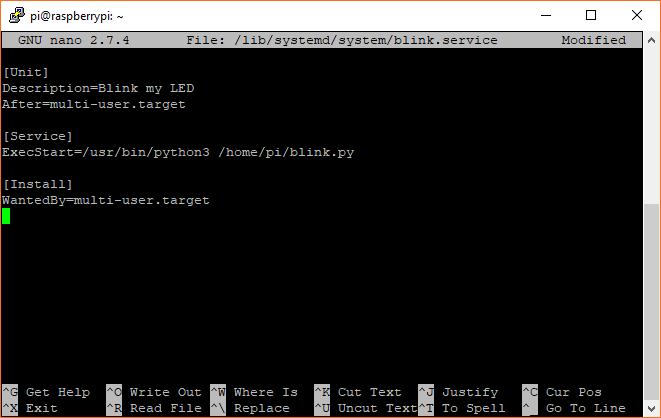 Without it, the rc.local script would wait for your script to end before continuing, and if you have an infinite loop (like in our blink.py program), you would never get a login prompt. You might notice that your program runs great, but there's no easy way to stop it! The simplest method would be to remove (or comment out) the line you added in rc.local followed by a reboot, but that takes a lot of time. 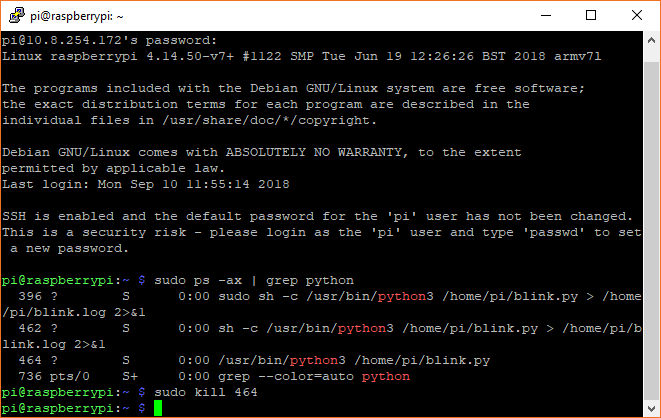 After your desktop environment starts (LXDE-pi, in this case), it runs whatever commands it finds in the profile's autostart script, which is located at /home/pi/.config/lxsession/LXDE-pi/autostart for our Raspberry Pi. 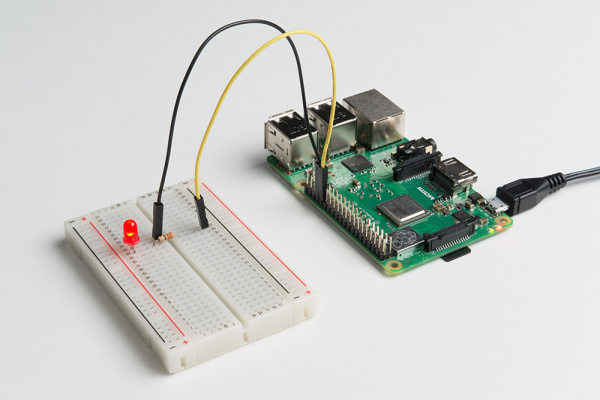 Note that the directory pi might be different if you created a new user for your Raspberry Pi. If no user autostart script is found, Linux will run the global /etc/xdg/lxsession/LXDE-pi/autostart script instead. You do not need root-level access to modify your profile's (user's) autostart and .desktop files. In fact, it is recommended that you do not use sudo, as you may affect the permissions of the file (e.g. the file would be owned by root) and make them unable to be executed by autostart (which has user-level permissions). If your script does not run as soon as you see the desktop, there could be several issues. First, make sure that you have logged in (autostart does not start until you have logged in). You could also try enabling auto-login in raspi-config. Second, make sure you are using absolute directory names (e.g. 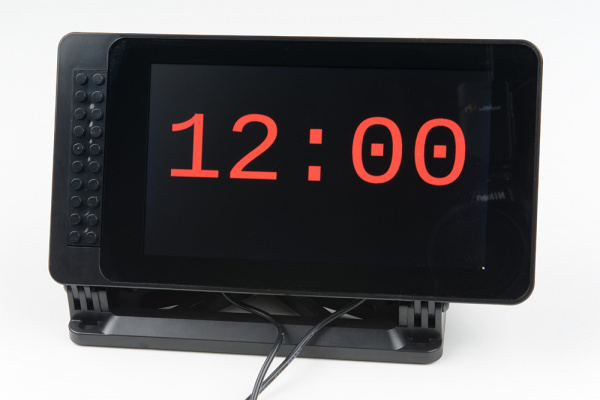 /home/pi/clock.py). Third, try following some of the suggestions below to enable stdout and stderr to see what's going on. Restart your Raspberry Pi. 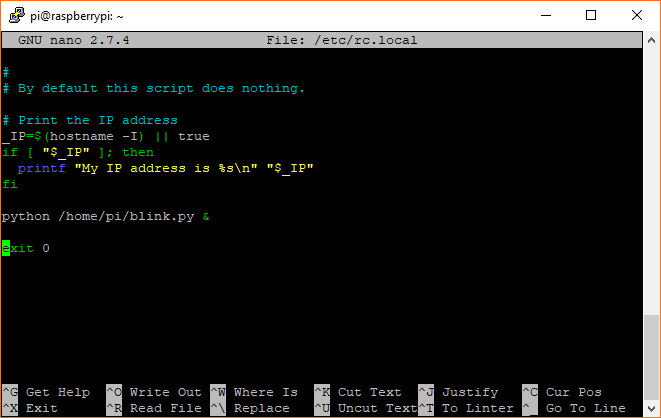 Now, after you log into your desktop, you should see a new terminal window open followed by your program running. If you stop your program (exiting out of it, pressing ctrl + c in the xterm window, or killing the process as detailed below), the xterm window will stay open, allowing you to read all of the output and error statments from your program. A unit file is a plain text file that gives information to systemd about a service, device, mount point, etc. We'll create a unit file that starts our program as a service (a process that runs in the background). Below are two examples of unit files: the first runs the blink.py example before the graphical desktop loads (useful for headless environments), and the second runs the clock.py example after the graphical desktop loads (useful if you are making a dashboard or GUI). Feel free to change the Description as desired. The After key denotes when our program should run. multi-user.target is the system state where control is given over to the user (a "multi-user shell") but before the X Windows System is started. That means our program will run even without logging in! You can change this, depending on which services you need active before running your program (for example, network.target if you need networking). See here for a listing of all targets. WantedBy in the [Install] section specifies the target we want our service to be included with. In this example, we want our service to run when the multi-user.target unit is run (or, more specifically, just after it, based on the After parameter). Under [Service], we specify some environment variables. 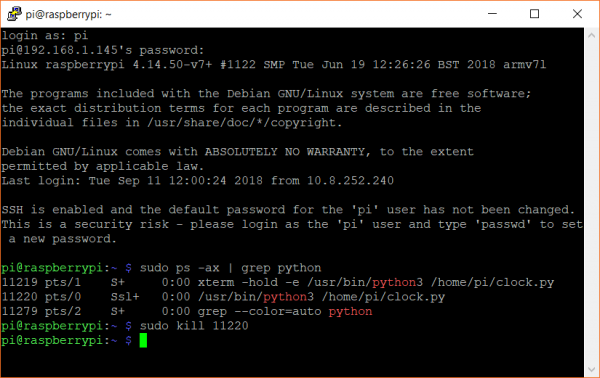 We want to connect to our primary display (this assumes only one display is connected to our Pi), so we set DISPLAY to :0, and we tell our application where to find the necessary credentials to use the X windows system with XAUTHORITY. 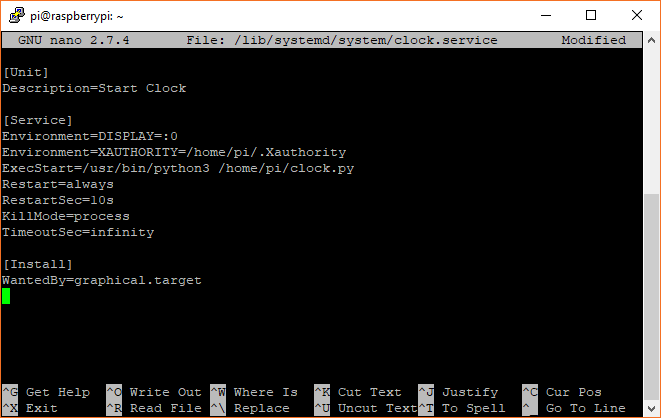 ExecStart is the command we want to run (starting our Python clock program, in this case). Unfortunately with systemd, we cannot tell exactly when the X system will start, and we cannot necessarily guarantee that a user will be logged in (unless you have enabled auto-login with sudo raspi-config). To account for this, we will brute force our program to restart (with Restart) every 10 seconds (with RestartSec) if it fails or exits. KillMode tells systemd to kill off any processes associated with our program if the service fails (or exits), and TimeoutSec=infinity means that we don't ever want to stop trying to execute our program. This can off some insight into what's going on with your service or program. Note that stopping the service should send a stop command (SIGTERM--terminate signal) to your program. In most cases, this should stop the service and your program. If your program does not stop, see below on stopping your program. This can be helpful to restart a service if you've made changes to it without having to reboot the system. Just remember to run sudo systemctl daemon-reload if you do make any changes to a .service file!